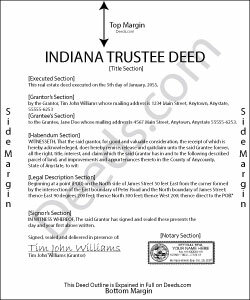 Use this form to transfer real property located in Indiana out of trust, without warranties of title. The deed should be executed by the trust's acting trustee(s). The trustee serves as the grantor in the trustee's deed. If there are multiple trustees or the trustee appears as a successor, this information is included also. The settlor does not enter directly into the transaction . In addition, the deed states the trust name and date under which the trustee is appearing, as well as any amendments made to the trust instrument.